I remember there was this period when I start venturing into making breads and buns and each and every loaf was kneaded purely with hand and love for an average of 30mins per recipe. I'm afraid of failure and I believe you should be, too. Thank God this recipe is fail-proof and yield a small quantity. 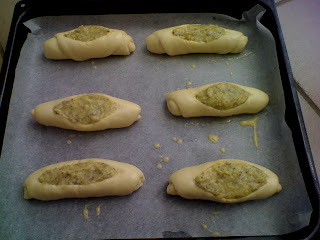 I always try to not have leftovers as I did not add any bread improver into the dough so the breads or buns will usually turn stale the very next day. 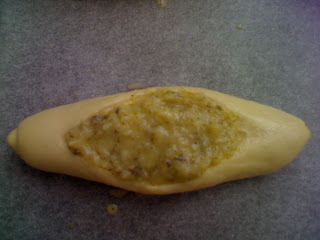 I have adapted yet again another recipe from HHB. Her garlic buns were very good... It's soft yet fluffy when just out of the oven.... I thought the garlic paste look like mashed banana. I just snip the opening of the bread with a pair of scissors as all the knives in my kitchen were blunt. My buns weren't really torpedo shape either. But, all that doesn't matter as the texture was what I was going after rather than the look. 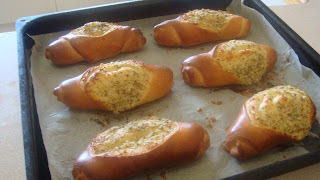 Presenting to you here my joy of baking in the kitchen, my lovely tray of garlic buns fresh out from the oven! This is currently my favourite bun! 0 comments on "Garlic Bun"